This piece for Tenor Saxophone and Harp was written in 1996 and premiered by Andy Scott and Lauren Scott, who recorded it on the CD, “My Mountain Top”. 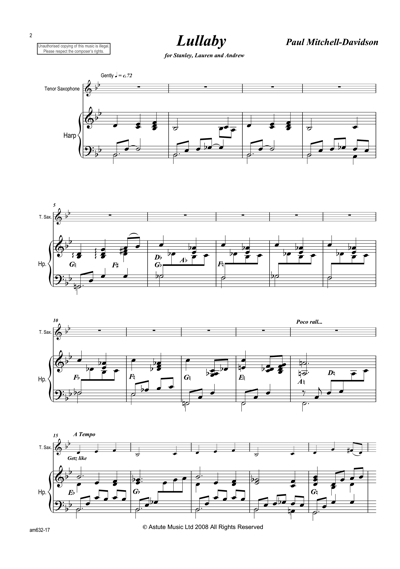 Lullaby displays the composer's musical versatility, combining classcal writing with jazz references (the saxophone player is instructed to perform “Getz like” – a reference to the distinctive qualities of the great jazz tenor saxophonist Stan Getz.) 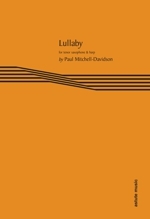 The composer says “Lullaby is a tonal piece but with some unexpected twists in the harmony. It should be played simply and freely.” Dedicated to Stanley Scott.